VERO BEACH, Fla., - March 16, 2016 - Piper Aircraft, Inc. has chosen Legacy Flight Training as the official training provider for the M600 aircraft. Under the new agreement, Legacy will provide pilot and maintenance training for the Piper M600, the newest member of the M-Class family, which product was publicly announced in May of 2015. "The selection process was highly competitive and Legacy's customer-focused approach, technological leadership and factory located training center are what set them apart. We will be ready for customers with a complete training program, including the deployment of a full motion flight training device, to support entry-into-service of the M600 later this year," said Drew McEwen, Vice-President of Sales and Marketing at Piper Aircraft. The pinnacle of the esteemed M-Class line, the M600 is named for the 600 shaft horsepower for which it is capable. With all new Garmin G3000 touchscreen panels in an evolved configuration, as well the addition of several advanced safety features in the cockpit, the M600 warrants a standard of training all its own. 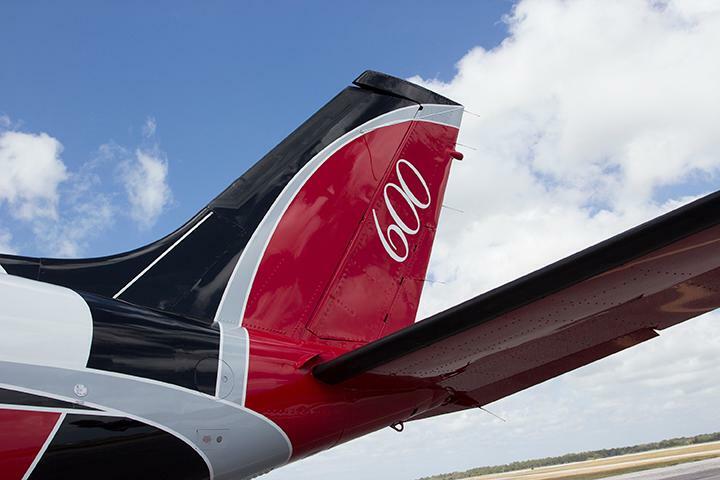 The newest edition to Piper's M-class family, the M600 is a single-engine turboprop that seats six with club seating. It is powered by the Pratt & Whitney PT6A-42A 600shp engine, sports a 274 ktas / 482 km/h max cruise speed, and has a range of up to 1,441 nm / 1,852 km. The aircraft features a well-appointed, luxurious interior available in three color palettes. Equipped with the Garmin G3000 avionics suite and the most advanced safety features available in any single-engine turbo prop, the M600 is a dynamic personal aircraft and powerful business tool. Headquartered in Vero Beach, Fla., Piper Aircraft, Inc. offers aviators throughout the world efficient and reliable single- and twin-engine aircraft. The single-engine M-Class series - the M600, M500, M350, and Matrix - offers businesses and individuals elegant performance and value. The Twin Class Seneca V and Seminole balance proven performance, efficiency, and simplicity in twin-engine aircraft. The Trainer Class Archer TX/LX, Archer DX, Arrow, Seminole and Seneca V aircraft form the most complete technically-advanced line of pilot training aircraft in the world. All Piper airplanes feature advanced Garmin avionics in the cockpit. Piper is a member of the General Aviation Manufacturers Association. Established to provide the owner and operator of Piper aircraft with the highest quality simulator and flight training, Legacy Flight Training LLC is committed to innovative technology. For more than six years, Legacy has provided knowledgeable, experienced instructors for initial and recurrent training. With courses and simulators to support the entire line of Piper aircraft, Legacy Flight Training is conveniently located in beautiful Vero Beach, Florida, adjacent to the Piper factory. January 4, 2016 - Vero Beach, Fla. Legacy Flight Training has moved their Vero Beach base of operations to a new training facility on-site at the Piper Aircraft Headquarters. The new training facility easily houses the existing Meridian and Mirage/Matrix simulators and offers ample space for additional simulators in the future. The new location also provides room for additional and larger classrooms, allowing for expansion of training services. "Legacy Flight Training enjoyed our first five years of operations in the Vero Beach Terminal Building, but had definitely outgrown the space," said Bill Inglis, President & Owner at Legacy Flight Training. "Our new facility on-site at Piper has been designed with an eye towards growth. With this additional space, we'll be in a position to quickly add additional simulators and training tools, as well as additional classrooms." The new facility, which has been completely renovated, has been designed to accommodate all Legacy Flight Training operations today and in the future. Classroom space allows for multiple, personal classes to operate comfortably in tandem while additional clients are trained concurrently in the simulators. The new KVRB facility will also provide more space for client break time, instructor offices, and administrative offices. Additionally, the new facility provides large classrooms to accommodate a broad array of training tools to facilitate additional Piper-focused training, such as factory-authorized maintenance training. Bill Inglis went on to say, "We are proud of our partnership with Piper Aircraft. The Piper team has been extraordinary in facilitating this move. Every Piper employee is clearly dedicated to providing an excellent customer experience during every phase of a customer's ownership time. It is clear that Piper cares about the safety of their customers and they illustrate that commitment by continuing to invest in insuring that their customers are as safe as possible and have access to professional, high quality training." Legacy Flight Training is an Authorized Piper Training Center, is FAASTeam approved and Insurance Company Approved. Training is provided by experienced staff with PA-46 specific experience and knowledge at facilities in Vero Beach, Florida, and in Scottsdale, Arizona. Those interested in training with Legacy Flight Training in Vero Beach or Scottsdale should visit LegacyFlightTraining.com. Legacy Flight Training is proud to announce the delivery of their much anticipated full-motion Piper Meridian flight simulator at their Scottsdale, Arizona training center. Legacy Flight Training’s facility at the Scottsdale Municipal Airport, open since early spring 2015, brings the unique expertise, process and training tools, once only available at its Vero Beach, FL facility, to Piper owners and customers on the west coast. Since 2010, the Company has provided a well-honed training curriculum that is customized to each specific customer and their skill set and incorporates the use of custom designed Redbird motion simulators to enhance training for Piper Meridian, Mirage and Matrix pilots. The inclusion of training in a full motion simulator offers pilots the opportunity to train for all situations and scenarios, including those too risky to simulate in the aircraft. The simulators can be configured to represent either the Garmin G-1000 or the Avidyne Entegra cockpits to allow pilots to gain familiarity and confidence by training in the cockpit that most closely represents their actual aircraft. Legacy Flight Training is an Authorized Piper Training Center, is FAASTeam approved and Insurance Company Approved. Training is provided by experienced staff with PA-46 specific experience and knowledge. The Center Director for Legacy Flight Training’s SDL facility, Jason Ottariano, was recently awarded Flight Instructor of the Year for the state of Arizona, and again as the 2015 Regional Flight Instructor of the Year for the Western Pacific Region. About Legacy Flight Training: Headquartered in Vero Beach, Florida, Legacy Flight Training is owned and operated by Bill and Diane Inglis. Since 2010, the company has operated the world’s only full-motion three-axis Meridian, Mirage and Matrix simulators configurable to Garmin or Avidyne glass cockpits, at their state-of-the-art training centers, at KVRB and KSDL. The company specializes in Piper PA-46 ground, flight and simulator training, and is dedicated to building life-long relationships through unequaled customer service. About Redbird Flight Simulations, Inc.: Redbird Flight Simulations of Austin, TX was established in 2006 with the specific purpose of making simulation more accessible to the general aviation industry. Since its inception, Redbird has delivered innovative, reliable and high-quality training devices to flight schools, colleges, universities and individual pilots around the world. With more than 700 devices in service worldwide, Redbird has quickly become the fastest growing and most innovative simulator provider in the industry. For more information, please visit www.redbirdflightsimulations.com. March 30, 2015 - Vero Beach, Florida. Right on time! Legacy Flight Training's second training center is now open for business. The new Legacy Flight Training facility, at the Air Commerce Center at the Scottsdale Airport (KSDL), joins Legacy's facility at the Vero Beach Municipal Airport, in providing PA-46 specific flight training and full-motion simulator training. Legacy Flight Training began operations at KVRB in 2010, and marks their 5th Anniversary this year with this expansion of services and continued robust growth. October 21, 2014 - NBAA, Orlando, Florida. Legacy Flight Training recently announced that they will be opening a second training facility on the Scottsdale airport (KSDL), in Scottsdale, Arizona. Following an extensive search process, Legacy Flight Training selected the Air Commerce Center on the Scottsdale Airport to house its west coast facility to cater to Piper PA-46 owners, with plans to open in the first quarter of 2015 with a new Meridian simulator, three functional multi-media classrooms, office space for the flight instructors and management, a customer reception area, and space for a Mirage/Matrix simulator. Legacy Flight Training article starts on page 22.